Palm oil has drawn a considerable amount of attention in Media and environmental organisations because of no such vegetable oil on the planet used in such a wide array of consumer products. We are sure you all not aware that palm oil is used in so many products but you all have heard about global problems related to its production. Palm oil is edible vegetable oil which is derived from the mesocarp i.e. 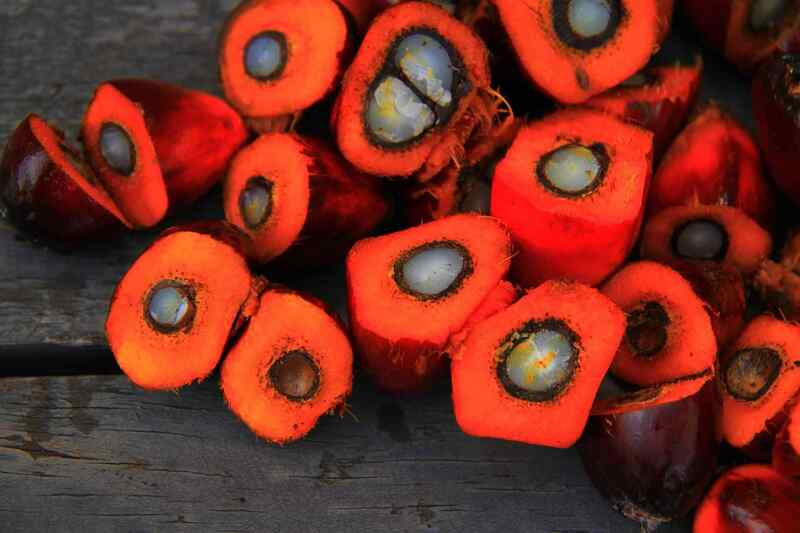 reddish pulp comes from the fruit of oil palms. The real cause of worry is the manufacturing practices and farming associated with palm oil. It is the most widely used vegetable oil in the commercial food market all around the world. Due to the high demand for palm oil, wider cultivation of palm trees has been encouraged which leads to deforestation in many countries around the world. Malaysia and Indonesia are badly affected. One o the major losses is that animals are losing their habitat and many of them are already on the endangered list. The bigger problem is that we are all responsible for it directly or indirectly. Palm oil produced in Central and West Africa. However, is in Malaysia and Indonesia where the clear majority of the oil is produced. This two-country account for 90 per cent of the entire world palm oil production. There are many feasible methods of producing palm oil that will not involve deforestation and animal deaths. There are efforts being set up to regulate proper guidelines for transparency and other standards. However, all corporations need to come forward to implement these guidelines and help infeasible methods of producing palm oil. There are many corporations who have joined the roundtable but they still need to adopt these guidelines. Now, let me tell you a few facts about palm oil that you not aware of. There are various studies that suggest that palm oil is responsible for higher risks of cardiovascular diseases and ischemic heart disease deaths. Also, it’s not only the food industry that uses palm oil now about 50 per cent of all products contains palm oil. It includes candles, cosmetics, washing detergents and even biofuels. 1. According to the World Wildlife Fund, there are about 20 million hectares of abandoned land available to grow palm oil trees. However, firms used to prefer clearing forests first to get double profit. One is by selling timber trees and another is for the oil. 2. Due to the palm oil plantation, Indonesia had the highest rate of deforestation in the world. Indonesia has managed to clear almost twice as much forest compared to Southern American country in certain years. 3. South East Asia has been widely affected due to fires used to destroy the rain forests. You will be sad to know that around 110,000 people die prematurely each year because of this toxic air pollution. 4. As of now, every third mammal in Indonesia listed under endangered species due to deforestation and encroaching on their habitat. 5. The palm oil industry also promoting child labour in remote areas of Indonesia-Malaysia leading to the human rights violation. They are made to carry high loads of heavy fruits. Also, they have been asked to spend long hours collecting fruits from the plantation floor. 6. At the beginning of the 20th century, about 250,000 tonnes of palm oil was exported annually from South-East Asia. Now, these figures have risen to 60 million tonnes. 7. One of the primary reason palm oil was so massively cultivated because it produces up to 10 times more oil per unit as compared to soya beans and sunflower. 8. At the same rate of deforestation, new studies suggest that Indonesian and Malaysian rainforests will be destroyed by the year 2022. 9. There are many animal species about to extinct due to massive deforestation for creating space for palm oil plantation. Endangered species are Pygmy Elephant, Sumatran Tiger, Asian Rhinoceros, Sun Bear, Clouded Leopard, Malayan Tapir, Proboscis Monkey, Gibbon and much more. 10. There are around over 50 orangutans are killed every week because of deforestation. Their homes are destroyed and they are burnt to death. One of the saddest facts about palm oil. 11. Apart from the above details that told us how bad is palm oil, there are certain aspects in which it is god also, like crude palm oil is rich in phytonutrients such as vitamin E tocotrienols, You all must be thinking about how this vitamin is useful for us, this vitamin is essential for the health of our nervous systems because of its neuroprotective property. It is essential for our immune system and also in the development of tissues and bones. 12. Now, if we talk about job creation and the effect of palm oil on the economy. The palm oil production, cultivation and processing has created a numerous number of jobs in the various countries and they are serving the economy well. However, the bad effects of palm oil can’t be ignored over these positive aspects of palm oil. 13. Palm oils can be best grown in the tropical regions on more than 500,000 hectares of land every year. The first phase of planting should be the best in order to get the best results and quality later. The Dami mas seeds are used by the GAR (Golden Agri-Resources) farmers and known to be one of the best yields and naturally resistant to the various diseases and the pests. Later, GAR (Golden Agri-Resources) developed SMART Research Institute (SMARTRI) with years of research producing seeds that are healthy and productive as well. 14. The trees of palm oil can grow upto 20 metres tall and have an average life of 25 years. Also, it grows best across 10 degrees north/south of the equator. The oil produced by the trees is also known as Elaeis Guineensis and each fruit that grows on the tres of palm oil contains 50% oil. The nut of the palm tree is known as the kernel and it is placed at the centre of the fruit and from them, only palm kernel oil is extracted. 15. The fibre that has been left from palm fruit processing provides a product called palm kernel expeller and it is used in the animal feed and also used for making products like paper or fertilizer. Each palm tree produces approximately 10 tonnes of fresh fruit bunches per hectare. The primary problem with palm oil is the deforestation of rainforest to make way for oil palm plantations. So, when the forests go so does the wildlife and hence greatest threat to the number of species increases. There are other adverse effects such as releases huge quantities of greenhouse gas and people are forcibly removed from their places. There are studies that say deforestation quadrupled since the early 1980s to 170,000km2 and 2km2 of forests cleared at every hour to make way for plantations. There are solutions that need to implement such as immediate plantation of rainforest, however, the ultimate solution will be the banning of all products made up of palm oil both at retailers and consumers end. These are the facts about palm oil that you should know Do post your comments.